Rev. 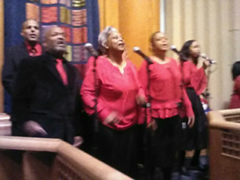 Roger Hambrick, pastor of Green Pastures Baptist Church brought his church choir to the Hebrew Institute of Riverdale, (H.I.R.) January 15. 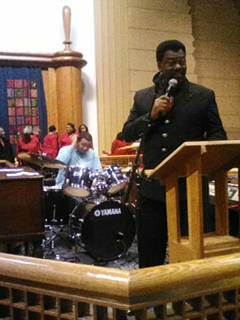 This was the 17th annual Martin Luther King Day concert at the H.I.R., featuring Rev. Hambrick and his choir, at this Bronx synagogue. The tradition began when Rev. Hambrick met Rabbi Avi Weiss, then H.I.R. 's senior rabbi, at a demonstration in the Bronx. protesting police brutality. Steven Exler is now senior rabbi at H.I.R. Rabbi Weiss sang the late Rabbi Shlomo Carlebach's "Brothers and Friends" on that occasion, introducing Rev. Hambrick to Carlebach's music. And when Rabbi Weiss invited Rev. Hambrick to bring his choir to the H.I.R., for Martin Luther King day, Rev. Hambrick readily accepted, starting an annual tradition that he loves, he told LPR. The January 15 concert featured several of Carlebach's songs, and closed with "We Shall Overcome." A few years ago, Carlebach's daughter sang with the Green Pastures choir at H.I.R., and Ms. Carleback and the choir recorded an album of her father's songs, "Higher and Higher." Foreign venues where Rev. Hambrick and members of his choir have performed include Israel, Spain, and Italy Rev. Hambrick has even taught gospel singing in Japan, he told LPR. Rev. Hambrick and his Green Pastures Baptist Church choir bring a very special, uplifting -- indeed glorious -- sound that LPR believes, cannot help but bring people together. For starters, LPR recommends that the Neshama Carlebach/ Green Pastures choir album. Or check out the January 15 concert at You Tube. Just google "Rev. Roger Hambrick and the Green Pastures Baptist Church choir." Rev. Roger Hambrick, pastor Green Pastures Baptist Church. Members of the Green Pastures Choir. Rev. 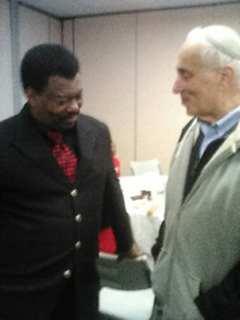 Hambrick and Rabbi Avi Weiss.